Sheltered, and unable to escape her bloodline, Serena St. Michael has spent the last two years training at the Royal Protector Academy. Struggling with a dark past, Tristan Gallagher’s current assignment is to protect a lifetime of secrets. One chance encounter will change everything. Serena must decide if she will follow her heart, forsaking all she’s ever known and risking a future worse than non-existence. Tristan will break every rule to save Serena, even if he can’t keep her. In their world of darkness, one love will ignite an ancient war. When pasts collide with the present, and secrets are revealed, will love be enough? Or will one lie destroy it all? When you’ve hidden behind a mask for so long, would you reveal yourself for love? Vernal is the first novel in The Royal Protector Academy series. A dangerously exciting and darkly romantic tale that will take your breath away. It can be read as a stand-alone trilogy, or after the bestselling Revelation Series. Intended for mature readers 18+ due to language, mild violence, and sexual situations. Lions, and Dragons and Wood Nymphs… OH MY! Remember Three Men and a Little Lady? 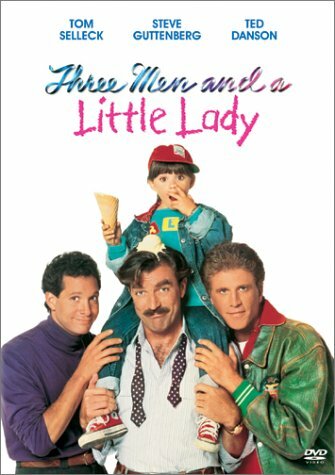 It was the sequel to this romantic comedy about three dudes who find a baby in the hallway of their apartment building and raise it til the mom shows up… and then they become a big ole’ happy family. In Little Lady, the guys are forced to deal with change -in how they interact with the little girl and their lives in general. Change comes to us all – even three quirky dudes and a baby girl. The loveably-askew St. Michaels boys of the Revelation series (we reviewed the last one) are back with their all-grown, reluctant princess, Serena, the daughter of Callan and Abby. She is quirky, earthy and all-things non-royal, and I loved her right away. As does the son of Gage Gallagher – the hot and steamy Tristan. But Tristan knows from day 1 that this pairing isn’t really something they can want – something they SHOULD want. He remains the level-headed one trying to prevent it, even as forces beyond their control threaten everything they are… as well as Serena’s very life. In this first book in the spinoff Royal Protectors Academy series, by Randi Cooley Wilson, we know this isn’t just a “business as usual” continuation of the same story. There are characters that carry through, and partial storylines, but in reality, we have new focuses and foes, lovers and losers. Ms. Wilson carves out a new solar system in a universe we already love, and we can’t help but fall in love all over again. content (so don’t say I didn’t warn you! lol) but it seems appropriate and timely for the story, with natural buildup and logical progression. They bring the sizzle from the very first chapter, until the very end. So should you read it? It’s going to KILL me to wait for the next book, and this book does leave you breathy and wanting more at the end. However, it’s so good you can overlook it (or start a re-read from the beginning each time you’re waiting for a new one… that could work 😉 ) but there are so many nuances that make this story possibly more interesting than her first series! I love that she starts addressing social issues too, but not in a completely in-your-face way. And then when you’re ready, meet Serena and Tristan in Vernal and get tickled #VernalPurple by those #DamnGargoyles – just like the rest of us! I devoured her Revelation series, can’t wait to read this one!